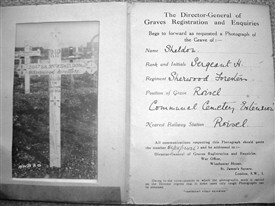 Harry Sheldon (204788 H. Sheldon Sgt), who worked on his family’s farm at Collingham, signed up with the 16th Sherwood Foresters (Notts and Derby Regiment) at Retford just short of his 22nd birthday, on 2nd November 1914. He was promoted from Private to Corporal within six months, and was given his Sergeant’s stripes in 1917. Against the odds, he survived for four years, all but six weeks, before being killed in action on the Somme on 26th September 1918. He is buried along with 757 other identified casualties from both sides of the war in the Roisel Communal Cemetery Extension. Roisel is a small town around a dozen kilometres east of Peronne, in Picardy. The extension to the town’s own cemetery was actually begun by German troops but, after the village was retaken by the British in September 1918, was developed in the next two months by the British casualty clearing stations. 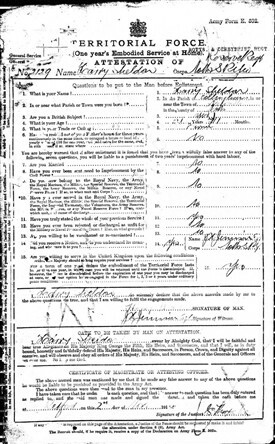 Harry made his will on 19th December 1917, witnessed by his company commander Capt William J. Chalmers, in which he left ‘all my property and effects’ to his father, George Sheldon. He had been quite an eligible bachelor, leaving £6,159 which equates to almost £200,000 at today’s values. 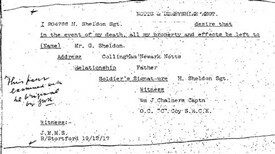 Harry Sheldon was not a member of my immediate family, but his sister Edith married into my mother’s extended Storm family. She and her husband William Storm, my mother’s second cousin, farmed at Sutton on Trent from 1933 until her death in 1972. This article and the accompanying images are from my book Pieces in a Jigsaw - A Family Perspective. This page was added by Graham Snowdon on 13/08/2014. 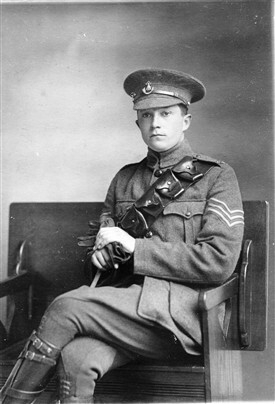 Although a Sergeant, in the photo he appears as a cavalryman (bandolier, boots) and does not have the cap badge of the Sherwood Foresters. Perhaps you could check with Colin Storm? Thank you for that. I will make some enquiries, but as you can see his regiment is definitely listed as the Sherwood Foresters on the notification sent from the War Office. 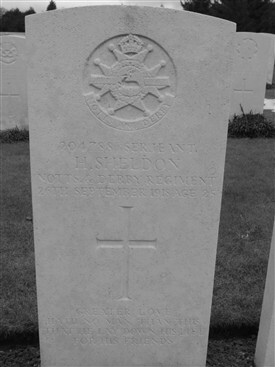 His headstone, which I have visited, refers merely to the Notts & Derby Regiment. Apparently, it is the cap badge of The Nottinghamshire Yeomanry (Sherwood Rangers) which is believe was a territorial regiment. You probably know more than me about the likely link between the two, so any help would be appreciated.